Mermaid Theatre of Nova Scotia captures all the magic of Marcus Pfister’s award-winning book series. 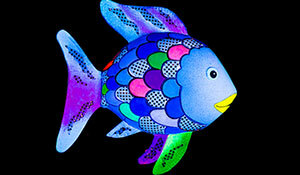 In The Rainbow Fish, a beautiful fish finds friendship and happiness when he learns the value of sharing. 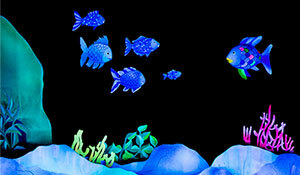 In Rainbow Fish Discovers the Deep Sea, he finds the courage to venture into unknown depths, where he discovers a new world filled with friendly creatures of all shapes, sizes and colors. The last story introduces the concept of opposites, with sea creatures big and little swimming over and under, alone and together, fast and slow, and lots of other ways. 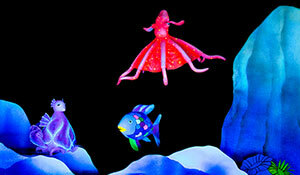 Exquisite scenery, luminous puppets, and original music make this show a truly “fin-tastic” experience! Autism-Friendly Relaxed Performances are specially designed to create a safe, welcoming environment for students on the autism spectrum or with other sensory sensitivities to experience the joy of live performance. Learn more about our Autism-Friendly Relaxed Performances. Questions about Performances for Schools? Prefer to Order by Phone?